Photo Caption: Woo Youn Han is presenting the Easy Voter Guide. "I just wish to return what I have received to others in kind." 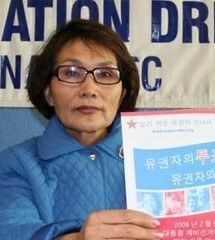 Miss Woo Youn Han is actively participating in the Korean Resource Center's "Power Vote 2008" precinct leaders group. She became a citizen last year, and 2008 is her first elections. Miss Han is participating in the group, because she wants to return the favor to others. After immigrating to the U.S. in 1995, she has been working in the youth service organization "House of Youth", and came to learn of various organizations serving the Korean American community. Much of the difficulties related to settling down in the U.S. - educating her children, purchasing a house, getting a job - were assisted by Korean American non-profit organizations. Miss Han has kept her gratitude deep in her heart. She has 8 years working as the program instructor of "APAC", an education program for the disabled, to give back to the community. It was the perfect career for her, since she was a Korean language teacher back in South Korea, and at the same time gave her the joy of sharing with the community. After becoming a citizen, she joined the Power Vote 2008 Precinct Leaders meeting starting December of 2007, and has been telling colleagues and friends in Church to participate in elections. She registered 10 new voters over the past month, and volunteered at KRC on Martin Luther King, Jr. day. "I want people to know that civic participation is our right, but that at the same time it is our duty as well", she said, and added: "I will actively participate all the way up to the November elections." The "Power Vote 2008" precinct leaders meeting is composed of all ages, from college students to 80-year-old senior grandmothers. Currently, 15 members meet every third Thursday at 6:30 pm at the Korean Resource Center. The meetings are scheduled to continue until the November elections.